Not enough screen space on your desktop? Do you flip back and forth between two windows because they're overlapping? GhostWin can help! 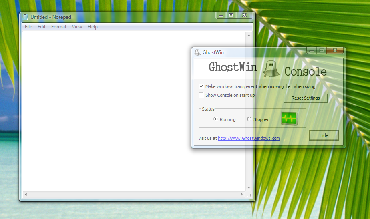 GhostWin allows you to make any application window slightly or completely transparent, and automatically adjusts the transparency level of windows that are being moved or sized so you can see what's underneath them ahead of time. New Updated Version 1.1 available. We'd love to hear frome you! Our products do not contain AdWare or Spyware.